Low Force Friction Welding -- What is it? Using our friction welding and solid state joining know-how, MTI has developed, designed, and manufactured low force friction welding machines that are operating in industry today. The low force process uses an external energy source to raise the interface temperature of the two parts being joined, thereby reducing the process forces required to make a solid-state weld compared to traditional friction welding. The process applies to both linear and rotary friction welding. The formation of flash is one of the most notable results of the traditional friction welding process. As the two parts are heated, the material at the weld interface softens. This material is then extruded from the weld interface by the axial force to form what is known as flash. The extrusion of flash from the weld interface expels contaminants from the bonding surfaces, essentially creating a self-cleaning weld. However, this flash may either need to be removed post weld or the part may need to be designed to accommodate the flash, depending on the application. With low force friction welding, on the other hand, the extrusion of little or no flash is possible. MTI can achieve low flash formation joints, thereby reducing both the consumption of material and post weld processing time. 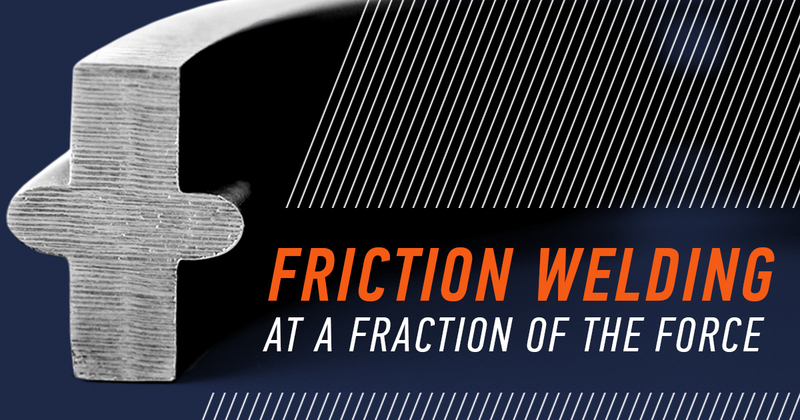 Low Force Friction welds can be made with flash formation with the same self-cleaning effect as traditional friction welds. The limitations of traditional friction welding, due to the high force that is used, no longer apply to the new low force technologies. Using low force friction welding, MTI can now join components that were previously unable to support the high welding loads associated with traditional friction welding processes. Low force friction welding can be applied to both rotary and linear forms of relative motion. This allows any component weld interface geometry to be joined, including components with either an interrupted or incomplete surface area. In addition, depending on the material being joined, low force friction can be used to create a wider heat affected zone (HAZ) than traditional friction welding. This may allow the manipulation of the material properties resulting in the weld zone. Extrusions that call for high integrity, like structural components and lightweight performance components. Using less force also allows MTI to decrease the actual machine size. Since low force friction welding reduces the process forces required to make a solid-state weld, the size of the structure which needs to react to the loads during the welding cycle may also be reduced. A smaller machine is a big benefit for manufacturers in the automotive industry looking to achieve lean manufacturing goals, while also opening doors to new applications that were previously unable to adopt solid state processes. Using the same approach to weld load reduction, MTI can also supply a system with the capability to weld a much larger cross-sectional area than traditional friction welding machines. This not only expands the machine range but also enables components previously deemed too large to now be welded on conventional sized machines. During a traditional friction welding cycle, the surface velocity—or the relative motion between the components’ weld interfaces—will be a function of the distance traveled over time. This relative motion is used to increase the temperature at the weld interface and can sometimes be relatively inefficient or difficult to control depending on the component geometry. The low force friction process reduces cycle time and material consumption by using an external energy source to increase the interface temperature of the parts being joined, which can be faster than traditional friction welding. Larger cross section components, like the ones typically used in the aerospace industry, may benefit significantly from these shorter cycle times. MTI is the only organization in the world to have developed, designed, and manufactured low force friction production machines that are operating in industry today. To discover if low force friction welding is right for your next project, contact me to learn more. We’ll build a machine that makes your part, we’ll make the part for you, or we’ll help you make the part even better.